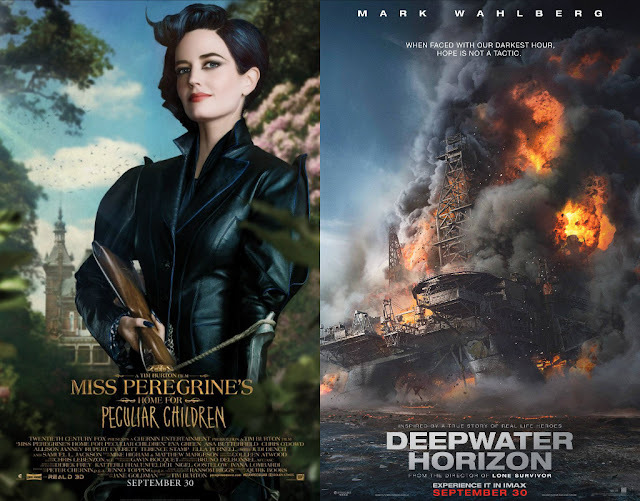 Dearest Blog: Yesterday it was off to Marquee Cinemas for a double-bill of Miss Peregrine's Home for Peculiar Children and Deepwater Horizon. Spoiler level here will be mild, nothing you wouldn't know from the trailers or perhaps the news. First up: Miss Peregrine's Home for Peculiar Children. Some characters straight out of his grandfather's bedtime stories turn a young man's ordinary existence upside-down. It goes without saying that a story with "peculiar" in the title is ideally suited to director Tim Burton. All of Burton's more recent projects have earned critical ire (mostly deserved), and, if Miss Peregrine isn't quite the Burton of old, at least it seems to be a step in the right direction. The film boasts glorious production design, some lovely set pieces, and stunning locations; Burton has not lost his ability to find beauty in even the strangest and most macabre things. Colleen Atwood's costumes and a wonderful score by Michael Higham and Matthew Margeson perfectly compliment the eerie atmosphere. Unfortunately, though the story is compelling, the movie seems to crawl along at a snail's pace. There's too little of the stellar Eva Green (who was born for this role), and too much of the bland child cast. Asa Butterfield is perfectly dreadful in the lead; he might as well have been reading from cards. Nothing points to 3D being a worthwhile investment on this one, aside from the fact that, in 2D, the movie's often too dark to see what's happening. Miss Peregrine's Home for Peculiar Children clocks in at 127 minutes and is rated PG13 for "intense sequences of fantasty action/violence, and peril." Miss Peregrine's Home for Peculiar Children is visually impressive enough to earn your big-screen dollars, but, sadly it's also something no idea so magical should ever be: kinda boring. Of a possible nine Weasleys, Miss Peregrine's Home for Peculiar children gets five. Fangirl points: Keep your eyes open for a rare and delightful Tim Burton cameo! Next up, the based-on-true-events tale of Deepwater Horizon. An explosion on a free-floating offshore drilling rig has disastrous consequences. Dear reader(s), Deepwater Horizon is one of those movies whose trailer was so ubiquitous and irritating that I worried the movie wouldn't have a chance of overcoming it, but I'm pleased to report my concern was mostly unfounded. Mark Wahlberg stars as Mike Williams, a technician on the rig who is central to this telling of the story. We're introduced to his insufferably cutesy wife and daughter (Kate Hudson and Stella Allen), then to most of the rig's crew through his eyes, giving viewers just enough of each person to make sure they'll be acceptably sad for the unlucky ones. The supporting cast has a fair few familiar faces: Kurt Russell, John Malkovich, and my celebrity boyfriend (per a super-scientific Buzzfeed quiz) Dylan O'Brien. There's enough setup to make it clear who're the Good Guys and the Bad Guys, and then--BOOM!--disaster. The film doesn't waste too much time getting there and, to its credit, moves along nicely throughout. The bulk of the picture plays out as the rig's situation deteriorates and crew members try to save themselves and others. Deepwater Horizon does a perfect 180 from its advertising, showing individuals behaving heroically, minus the frustrating chest-thumping vibe of the trailer. The movie's disaster effects are spectacular, with sound mixing and editing in particular deserving full marks. It's a bit dark and jiggly at times, but that only adds to viewers' ability to share the terror the folks aboard that rig must have felt. Two small and random quibbles: Did Williams' wife really take time to do her nails over the course of these harrowing hours? They're pink the whole movie, then a French manicure when she and their daughter reconnect with him at the hotel following the rescue. Also, looking at photos of the crew next to the actors portraying them, I'm thinking my wish to have Beyonce star in the story of my life isn't so unrealistic after all. Deepwater Horizon runs 107 minutes and is rated PG13 for "prolonged, intense disaster sequences and related disturbing images, and brief strong language." Deepwater Horizon might have been better suited to summer's action season than to awards season, but it's an edge-of-your-seat tale that hopefully will make the world more cautious and aware going forward. Of a possible nine Weasleys, Deepwater Horizon gets six.